Tomorrow marks the first anniversary of Mary Lou McDonald’s election as President of Sinn Féin. 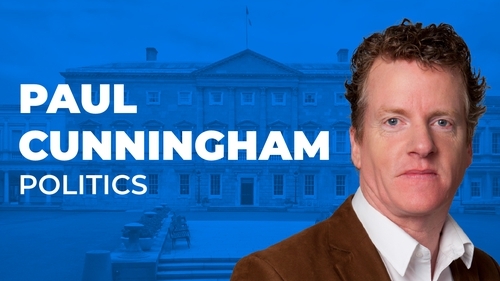 RTÉ's Political Correspondent, Paul Cunningham, looks at her career to date. Political leaders are judged on results, most especially electoral outcomes. This year, the new Sinn Féin President faces two tests with both Local and European elections in May. Given the turmoil in Leinster House over the nurses strike and the cost overrun at the National Children's Hospital - a General Election can't be ruled-out either. The fortunes of Sinn Féin in all of those contests are heavily dependent on the strategic nous and the campaigning capabilities of their new President, Mary Lou McDonald. Since entering the Dáil in 2011, she's already proven herself to be a formidable politician: a strong debater and an extremely media savvy performer. Yet the challenge she faces is to broaden her party's public support, without losing its traditional base. And both the opinion polls and Presidential Election result should give her cause for concern. Mary Lou McDonald was born in 1969, the year the Provisional IRA was formed. She has said that the 1981 hunger strikes, in which ten republican prisoners starved themselves to death, was a pivotal point in her political development. She joined Sinn Féin after the signing of the Good Friday Agreement in 1998. Ms McDonald stood out from other Sinn Féin politicians of the time: a woman, from the Republic and without a paramilitary past. Danny Morrison explained it to the BBC this way: "She's free from some of the baggage that the likes of myself, and other veteran republicans, would be carrying." That said, while Ms McDonald may not have been part of the republican past, she stoutly refuses to separate herself from the republican legacy. For example, at the special Ard Fheis last February, after just being elected to the Sinn Féin Presidency, she roared to the 1,500 delegates at the RDS: "Up the rebels! And tiochfaidh ár lá!" As Deputy Leader for many years, Ms McDonald has been a conference favourite. She's open and relaxed, always ready to have a witty pop at her political opponents. She's retained that quick-on-the-draw style in the Dáil as party President. During a debate on housing policy, with protesters at the Leinster House gates, the Taoiseach accused Sinn Féin of cynicism: "Sinn Féin doesn't want to solve this problem. They want it to get worse, because they believe they can benefit from it politically." Ms McDonald hit back: "Let's you and I go out to the people at the gate in an hour’s time and let's test whose credibility is in question on the issue of housing and homelessness - because I can tell you: it's not mine." Ms McDonald has tried to deal with some of her party's legacy issues, for example in meeting Maria Cahill last November. Ms Cahill has heavily criticised the party's response to her allegations of serious sexual abuse by a senior republican. Ms McDonald said afterwards she had re-iterated her apology. However, Ms Cahill said she left the meeting feeling "frustrated and disturbed". She accused the party of engaging in despicable behaviour towards her. Ms McDonald's term as Sinn Féin President began with her showing immediate leadership qualities on the issue of legislating for abortion. She campaigned to repeal the Eighth Amendment - notably putting her face on the party posters. At the party's Ard Fheis in Belfast later that year, members heavily backed her position and voted in favour of allowing the party leadership decide on abortion legislation and against allowing its TDs and Senators a conscience vote. Ms McDonald drove that policy forward despite grassroots concern at the more liberal approach and, more particularly, that it was likely to lead to the departure of long standing member and TD Peadar Toíbin and his Dáil colleague, Carol Nolan. If that was a positive, stamping her authority on the party, then the Presidential Election was anything but. It was Ms McDonald who backed the idea of Sinn Féin contesting the election, even when a campaign was likely to be expensive and the incumbent was unlikely to be defeated. The election didn't go well. It was a strategic blunder not to unveil their candidate, Liadh Ní Riada, until late September. The subsequent campaign never caught fire. The result was an ugly one: whereas Martin McGuinness secured 243,030 votes in 2011, Liadh Ní Riada only polled 93,987 votes - not even enough to recoup election expenses from the State. While the result was bad, it also raised questions about the capacity of Sinn Féin to reach beyond its base. Their presidential vote was only around half of Sinn Féin’s last outing in the 2016 General Election. That concern was crystalised in Liadh Ní Riada's comment that she would wear a poppy on Armistice Day, as a symbol of goodwill to the Unionist community. The gesture appeared to irk Sinn Féin supporters but not to attract new voters. Ms McDonald was defiant in defeat, saying at the count centre: "The decision to contest the election was taken on my watch. And I believe it was the right decision. I think that democracy is never wrong." Liadh Ní Riada (L) didn't poll enough votes to recoup election expenses from the State. Defeat is something that Ms McDonald knows only too well herself. She twice failed to get elected to the Dáil. She also narrowly failed to get re-elected to the European Parliament in 2009, losing her seat to the Socialist Party's Joe Higgins. Since being elected to the constituency of Dublin Central in 2011, she has, however, solidified her position as a top political performer. And in the upcoming electoral contests, it will be Mary Lou McDonald who will be front-and-centre. It's a place in which the Sinn Féin President is very comfortable. She's at ease on the campaign trail and the public appears to respond to her straight-talking profile. In May last year, one opinion poll ranked her as the most popular party leader. The question is whether she can maintain that image and project a relevant vision this year. The Local Elections in May will be watched closely, not just to see whether the party can secure more than its current stock of 126 seats, but also because of former Sinn Féin councillors who left the party alleging bullying against them. For the European Parliament elections, it seems Ms McDonald will stay close to the party's traditional critical stance. She told RTÉ: "Irish neutrality needs to be protected. Our sovereignty needs to be asserted. I hear Europe coming again with plans and notions of harmonising tax provisions across the Union, we will stand-up against all of those things." The real test, however, will be the General Election - whether it’s held this year or next. Ms McDonald has made it clear that she is interested in going into government. While saying "...my ideal is that Sinn Féin leads the government..." she has also articulated that: "... after the next election, I will talk to everyone." Asked if she had a preference of coalition partner, Ms McDonald said: "The truth is there is no ideal partner, as between Fianna Fáil and Fine Gael... it will be more about the 'what' of government rather than the 'who'." In any coalition negotiation there is going to be compromise. That's the judgement call Ms McDonald will have to make - whether the price of government is something she can get through a party Ard Fheis. Before all of that, Ms McDonald has to contend with Brexit. Both the Government and Fianna Fáil continue to criticise Sinn Féin for failing to negotiate the return of the Northern Executive. Her strategy is to blame the DUP: "The absence of a functioning government is an utter disgrace. There's no other way to put it other than that. I have said consistently that we stand ready to resolve the issues... in fact I believe we achieved that last February. I was more than disappointed when the DUP failed to deliver on that accommodation." While Sinn Féin is consistently backing the Government on defending the Irish backstop in the EU/UK Withdrawal Agreement, it is also arguing that there should be a border poll in the event of a hard Brexit. She told RTÉ's This Week programme: "I believe that in the best interests of our entire nation removing the border, rather than mitigating it, is the best way forward." The Taoiseach, Leo Varadkar, has decried that position in the Dáil: "By you introducing into this debate, at this time, demands for Irish unity, demands for a border poll, I believe are disruptive and destructive to trying to achieve what we want to achieve which is the ratification of this [Withdrawal] Agreement by the House of Commons." However, she wasn't always supportive of such a poll. Back in August of last year, she told the Press Association that a referendum on unification should be put to one side until the "dangers" posed by Brexit were mitigated. Ultimately, in any of these elections or referendums, Ms McDonald's fate hangs on whether she can connect with voters and sell Sinn Féin's policy platform. She has a strong frontbench, but the Sinn Féin leader will be front-and-centre. The danger is that she does not get talking about the future but instead ends-up explaining or justifying the republican past. Because on the campaign trail, those troubling questions will inevitably return: does she really believe that Gerry Adams wasn't in the IRA? ; does she support the Stack family who claim Mr Adams is concealing information about the prison officer’s murder? ; and does she agree with the PSNI which believes that PIRA structures still exist? The all-island nature of Sinn Féin can be an asset as well as a problem. The decision by Conor Murphy, the Armagh MLA, to visit the inauguration of Venezuela’s President Maduro led to Ms McDonald having to justify the trip. She described Mr Maduro’s election as "open and democratic" whereas the EU and Irish Government asserted it "lacked credibility." Sinn Féin will be watched closely for any emerging tensions between its power centres of Belfast and Dublin. Mary Lou McDonald was groomed for her current role from a long way out. She was their deputy leader for years. She was unopposed in the election to become Sinn Féin President. All the responsibility falls on her shoulders.